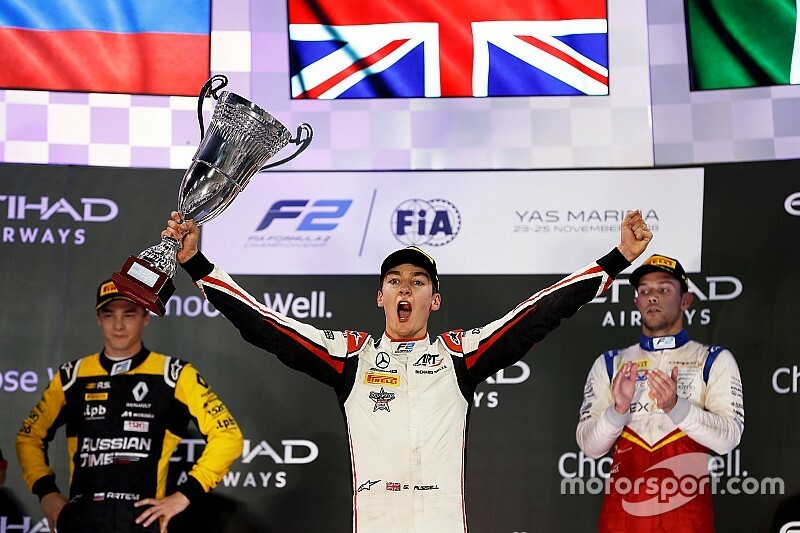 Mercedes Formula 1 junior George Russell secured the 2018 Formula 2 title by taking his seventh race victory of the year in the Abu Dhabi feature race. Future Williams F1 driver Russell went into the feature race only needing eighth to secure the title after scoring pole, but a poor start dropped him to second behind Prema's Nyck de Vries initially. 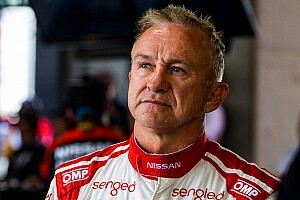 The only driver that could still deny Russell, Alexander Albon, stalled from eighth on the grid as his DAMS teammate Nicholas Latifi also failed to get away and was hit from behind by Arjun Maini. That caused a lengthy safety car period that allowed Albon to recover the lap he lost by stalling, but the Anglo-Thai was still half a lap adrift of the pack when action resumed. Russell was aggressive on the restart and nearly collided with de Vries at Turn 9, but the Dutchman held on and subsequently built a small lead. Russell on the other hand was soon under pressure from Artem Markelov (Russian Time), and was the first frontrunner to change his supersofts for softs on Lap 8. De Vries followed suit a lap later and while he could just rejoin ahead of Russell, the ART driver made a successful move on warmer tyres at Turn 5. 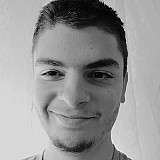 Markelov pitted next time around and slotted in behind Russell and de Vries, and the trio were already up to second, third and fourth as the majority of the field except Luca Ghiotto completed their stops. Ghiotto had a 23s gap on the field on older soft tyres compared to the likes of Russell, but the Italian still managed to extend his lead as the race progressed. 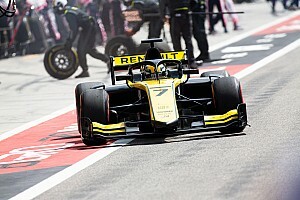 However, his victory charge ended when he received a five-second time penalty for cutting the track and when he pitted, serving the penalty before his stop, he rejoined only fifth. Russell meanwhile kept a two-second gap over de Vries, and went on to win the race by 3.3s to seal the title with a race to spare. 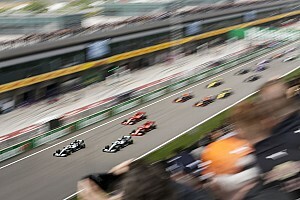 De Vries started losing pace during the final stages and was overtaken by Markelov for second at Turn 11. While Markelov couldn't close in on Russell, Ghiotto again emerged as a threat as he had massive advantage on fresh supersofts, but ran out of time to challenge for the victory, and settled for third ahead of de Vries. 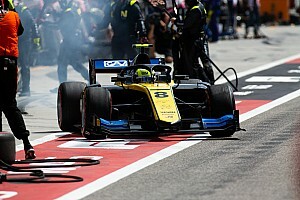 Lando Norris (Carlin) temporarily passed Markelov after the pitstops but eventually couldn't keep up, taking fifth 19 seconds behind. Charouz duo Louis Deletraz and Antonio Fuoco finished sixth and seventh respectively with Roberto Merhi (Campos) securing reverse-grid pole in eighth. 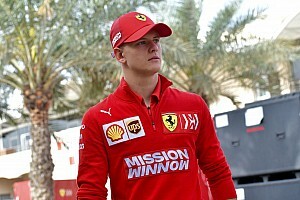 The Spaniard held off Tadasuke Makino (Russian Time) by just four tenths, while the top 10 was completed by Russell's ART teammate Jack Aitken. Dan Ticktum (Arden) finished 11th on his F2 debut, missing out on points by one position - albeit by 9.6s. Albon, who started on softs, was up into the top 10 by not pitting in the early stages but dropped down the order when he finally took his stop, eventually settling for 14th. Besides Latifi and Maini, Nirei Fukuzumi also retired at the start despite narrowly missing the stalled DAMS car.